During a frantically busy trip to Europe, I hopped on a train and slipped off into Germany's dreamy Mosel Valley, figuring that a dose of quaint, cobbled towns and storybook castles was just what I needed. 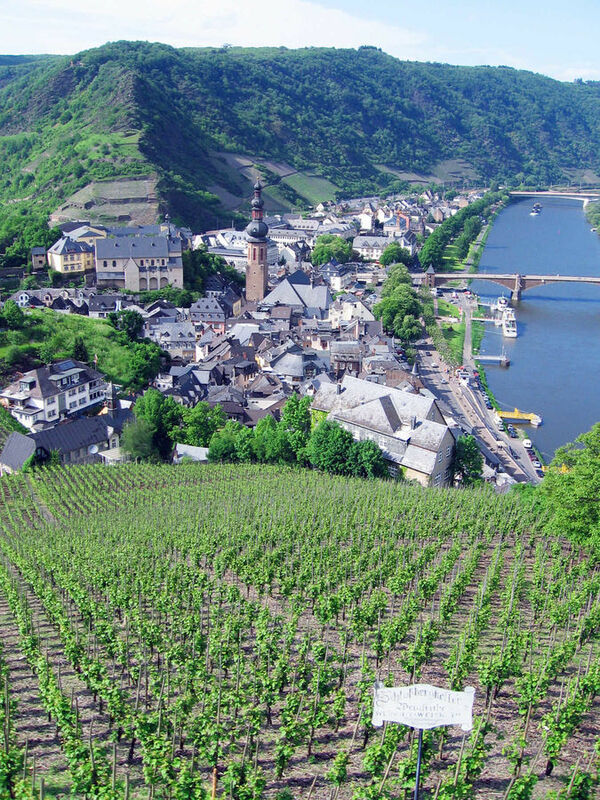 The Mosel, located near Germany's western border, is the Rhine's peaceful little sister. The main tourist town of Cochem, tucked between steep vineyards and the river, boasts picturesque medieval streets. 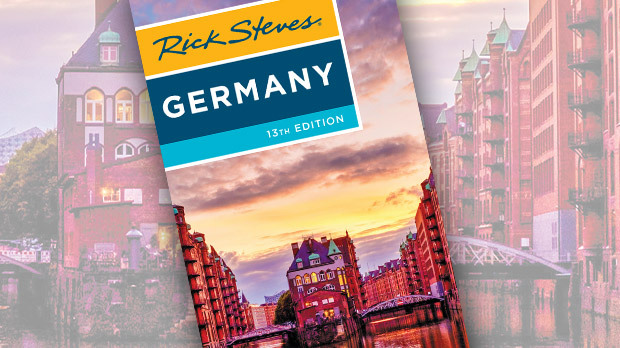 Stroll the delightful riverfront promenade, play life-size chess, or just grab a bench and watch Germany at play. To join in the fun, take the Sesselbahn (chairlift) up to a hilltop (and restaurant), enjoy the views, hike down, and end up at a wine-tasting at Weingut Rademacher. Wine-tasting is a popular activity here. Sample local white wines or Roter-Weinbergs-Pfirsich Likör — a cordial made from the small, tart "red peaches" unique to the Mosel Valley. Throughout the region on summer weekends and during the fall harvest, towns host wine festivals with oompah bands, colorful costumes, and dancing, powered by the good food and wine. Like most Mosel towns, Cochem grew up below its castle. Though it looks majestic — rising from a hill above town — Cochem's castle is better admired from afar. This 19th-century reconstruction is more fanciful than authentic. Burg Eltz, on the other hand, is the real deal. Lurking in a mysterious forest about 30 minutes by car from Cochem, this is my favorite castle in all of Europe. Thanks to smart diplomacy and clever marriages, Burg Eltz avoided wars and was never destroyed, remaining in the Eltz family for eight centuries. The castle is furnished throughout basically as it was 500 years ago. That's rare in castles. It was a comfortable castle for its day: 80 rooms made cozy by 40 fireplaces and wall-hanging tapestries. The Grand Gallery was where nobles met. A carved jester and a rose look down on the big table, reminding those who gathered that they were free to discuss anything ("fool's freedom" — jesters could say anything to the king), but nothing discussed could leave the room (the "rose of silence"). The finely decorated master bedroom contains all the comforts of the time, including a toilet — one of 20 in the castle, each flushed (occasionally) by rainwater. Just upstream from Cochem is Beilstein, the quaintest of all Mosel towns. If you're looking for convalescence, this is the place to go. Beilstein has zero food shops, zero ATMs, one bus stop, one mailbox, and 180 residents who run about 30 guest houses and eateries. It's nicknamed the "Sleeping Beauty of the Mosel" because until about 1900, it was inaccessible except by boat. Today it's still just grape vines, cobbles, fancy door knockers, the smell of dank back alleys, and Mosel River views. Midday in peak season, its charm is trampled by tourists. But early and late, it's a dream. On my first morning here, a rumble shook my room at the Hotel Haus Lipmann and woke me up. Stepping outside onto my small terrace, I saw a massive barge filled with coal lumbering by on the river. In a moment, it was gone, and I was left with the tranquil essence of the Mosel. Across the glassy river, the little ferry was parked. Above it a church spire stuck like a slate spike through a hill cloaked in a green corduroy of vineyards. As if animating some symphony to the direction of a cosmic conductor, a huge and orderly flock of black birds swooped back and forth like sound waves across the fields and around the spire. 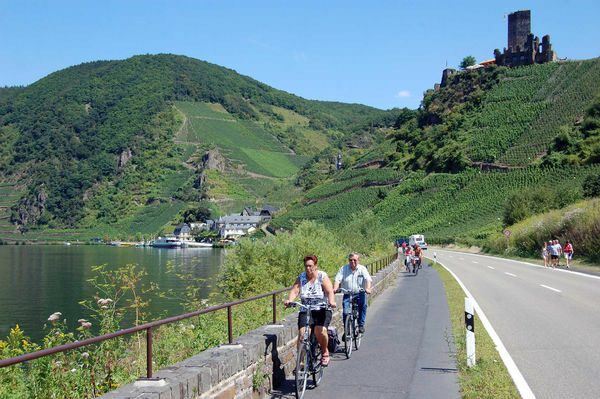 Biking and boating are great ways to while away a Beilstein day. Boats come and go all day for relaxing river trips, though because of the locks, they can take longer than you'd like. I opted for a riverside bike ride. Smooth and perfectly flat bike lanes remain separate from car traffic, allowing you to ride in peace while admiring gorgeous riverside scenery. Wrapping up my day, I sat on the hotel's terrace. Sipping my sprightly white wine, I gazed at the tiny two-car ferry sliding on its cable back and forth across the river. Its slow, monotonous rhythm, and the bikers that came and went with each landing, were mesmerizing. At dinner, Jonas, who runs the hotel, served me homemade bread with tubs of Schmaltz (greasy pork lard). I asked him if he knew Barry Manilow. He said yes. I said, "Schmaltz is to butter what Barry Manilow is to music." Jonas said, "Ja, schmaltzy." But I like the tune the Mosel River plays. It's impressive that just a couple of quiet days here can relax your mind and restore your spirit.